The cylindrical designed FPSO (Floating Production Storage and Offloading vessel) being built by the COSCO QiDong shipyard in China will carry a package including four Chemical injection skids, one Methanol injection skid and also a Methanol distribution cabinet, manufactured in the Tyco facility in Norwich, UK. The advanced, bespoke equipment will be pivotal to maintaining the economic flow of oil from the Harris and Barra fields, which have a sea depth of 165m and a reservoir depth of 6000ft. The Western Isles Project is located 165 miles east of the Shetland Isles and is being developed by a partnership between Dana Petroleum and Cieco in a $1.6 billion investment. The field is predicted to yield a peak flow of 40,000 barrels a day with a life of some 15 years. This output, in turn, will play a key role in meeting the UK’s future energy needs. Government permission was granted in December 2012 while first oil was extracted on April 24th last year, following drilling of the wells by the Ocean Nomad semi-submersible rig. When drilling is complete there will be at least five oil and four water injection wells, all tied back to the FPSO, and it is the complexities of this extraction strategy, which have determined much of the design, development and assembly work carried out by Tyco, along with its supply chain partners both within and outside the UK. As an acknowledged leader in the field of Chemical and Methanol injection packages for Oil and Gas production, Tyco liaised with COSCO and Dana Petroleum throughout the tender and design process generating 3D CAD drawings and specifications for further evolution. These are the largest such skids Tyco has so far produced since the company entered the chemical injection business in 1995. Part of the manufacturing had to be completed within a temporary scaffolding enclosure outside the building; adding a further dimension to the exhaustive health & safety and fire protection procedures the company adheres to. Tyco’s vigilance in this area helped COSCO achieve the milestone of completing over two million man hours on the project without any time loss incidents. The methanol injection package required storage of 60,000L. 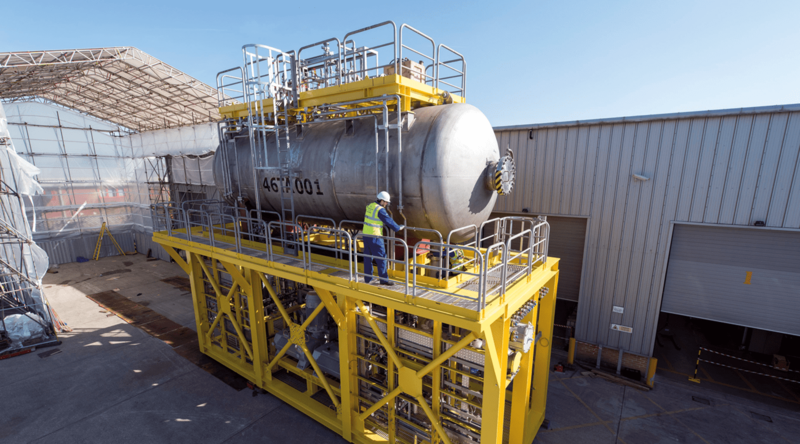 Tyco called on two of its most trusted partners to assist in the construction process, with a local company fabricating the Methanol package, which included a 60,000 litre pressure vessel to be mounted on the largest of the skids to contain the methanol. The idea behind this unusually high capacity is to significantly reduce the number of supply replenishments the FPSO will require during its time in the Western Isles. This will offer corresponding cost savings by reducing the number visits to the FPSO to replenish the methanol and potentially prevent interruptions to the work if adverse weather prevents supply vessels reaching the fields. The Chemical injection package comprised of the four smaller skids, which are designed to deliver chemicals such as scale inhibitor, corrosion inhibitor, biocide etc. throughout the Oil and Gas process subsea, subsurface and topside. The fabrication of these four units comprised of carbon steel skids with various capacity stainless steel reservoirs to contain the chemicals required. To avoid loss of production the Methanol and Chemical Injection systems have been designed with back up of many critical components such as the pumps, flow control valves and flow meters. Should there be a failure then the system can be switched from the duty to the standby component to maintain production. Tyco QHSE practices helped project achieve 2 million man hours without a time loss incidence. Furthermore, the pumps for the Methanol Injection skid were sized to maintain a flow rate of 12,000 litres per hour whereas 2,000 litres an hour is a more typical capacity for such installations. The Chemical Injection pumps are of a much lesser capacity delivering typical flow rates of less than a litre per hour. The flow to the injection points from both the Methanol and Chemical Injection packages is also regulated by flow control devices, which maintain a high level of accuracy regardless of changes to downstream pressure. The process lines comprise of both 6MO tubework and 316 stainless steel pipework. Process lines up to and including 1” have been manufactured using tube, while pipework has been used for diameters from 1.5” up to and including 12”. As well as the skills of Tyco’s team of expert tube fitters, technicians and electricians, the successful construction of the equipment has relied greatly on Tyco’s in-house design engineers and industry trained, coded welders. Within the rigorous quality assurance processes, all of the MIG and TIG welds undertaken are subject to visual inspections, radiographic and ultrasound scanning as well as hardness testing; with all such results being entered in the Manufacturing Record Book (MRB) for each skid. In addition, the project flow meters were sourced from Litre Meter and the pressure sensors from ABB. Much of the instrumentation is hard-wired back to the FPSO’s control room enabling the operations team to identify any supply problems and address them without delay. The packages have been fully engineered to meet all applicable EC directives, including ATEX and PED, all client specifications and to conform to the DNV Class requirements. Due to the meticulous design work and painstaking assembly processes employed at every stage of its contract, Tyco is fully confident that when COSCO finally secures the FPSO on station in the Western Isles fields, the Chemical and Methanol package will perform their duties safely and reliably throughout their 20 year design life. Simon Rooks is the Operations Director Oil & Gas at Tyco and has accumulated 30 years experience in the fire protection and life safety industry. He has been a Director of the Fire Industry Association (FIA), Director of the British Automatic Fire Sprinkler Association (BAFSA) and Chairman of the UK Water Mist Coordination Group. In his current role at TFIS, Rooks is responsible for ensuring the company provides the Oil & Gas industry with a portfolio of innovative technologies as well as specialist services and support to improve safety standards on drilling platforms, injection skids, FPSOs and other installations.